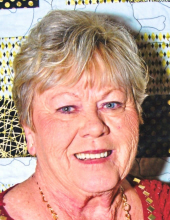 Betty Jane Smith, 71, of Vidor, TX died Tuesday, January 29, 2019 at her home. A native of Beaumont, TX she was a longtime resident of Vidor and a 1965 graduate of Vidor High School and attended class luncheons. Betty enjoyed watching her sons play sports when they were young. She also enjoyed cooking, watching western movies and having her nails and hair done at Cambios weekly and spending time with her family and friends, especially her grandchildren. Visitation will be Friday, February 1, 2019 beginning at 6:00 p.m. at First Baptist Church of Vidor. Funeral services will be Saturday, February 2, 2019 at 2:00 p.m. at First Baptist Church with entombment to follow at Restlawn Memorial Park. Betty is survived by 2 sons; Stacy Smith and his wife Vicki of Vidor and Ryan Smith and his wife Perri of Houston, TX, 5 grandchildren; Jenna Nicole Smith, Brody Lane Smith, Addison Paige Smith, Justin Jackson and Jacob Jackson, 2 great grandchildren; Evan Jackson and Easton Jackson. She is also survived by 2 sisters; Emma Rachal and Shirley Palermo, 2 brother; Jimmy Smith and Ronnie Smith and longtime friend; Allene Skiles. Betty was preceded in death by her husband; Robert Smith and her parents; George and Lena Smith. To send flowers or a remembrance gift to the family of Betty Jane Smith, please visit our Tribute Store. "Email Address" would like to share the life celebration of Betty Jane Smith. Click on the "link" to go to share a favorite memory or leave a condolence message for the family.